There is evidence, in the form of a ballot box inscribed Cruden Golf Club 1791 that a nine-hole golf course existed before the layout of today’s links course. It may have been located at the Ward Hill near Slains Castle, and indeed the Cruden Bay Golf Club of today has in its possession a winner’s medal from a competition played on the Ward Hill dated 1883. However our unique links course was commissioned in 1894 by the Great North of Scotland Railway Company and fully opened in 1899 as part of the recreational facilities offered by the Cruden Bay Hotel, newly erected and opened in March of that same year. The inner nine hole “ladies course” was also laid out at the same time. 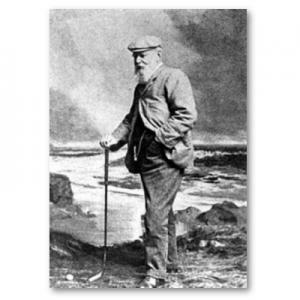 From the onset, golfers came from all over the world to play the championship golf course – designed by Old Tom Morris of St Andrews, with help from Archie Simpson. Its opening was celebrated with an inaugural professional two day open tournament on 14-15th April 1899, with prizes totalling £120. The leader after the first day’s play was Harry Vardon of Granton, with a score of 162, while J Kinnell of Prestwick scored 163, A Simpson of Aberdeen 164 and A Kirkaldy of St Andrews 165. James Braid and Ben Sayers were also in the field. On the second day the leading four qualifiers went into matchplay and in the final Vardon beat Kinnel by 3 and 2. We have discovered fantastic footage of the semi final between Harry Vardon and Ted Ray in June 1914 – follow the link for:- Scottish Screen Archive. The Cruden Bay Golf Club was formed around 1900, the first Captain being the Rev B Alcock. 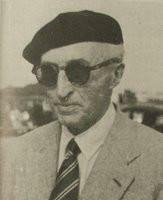 In 1926 the course was redesigned to the current layout by Tom Simpson and Herbert Fowler. They also redesigned the St Olaf course which was opened at the same time. By 1908 the course had been extended to 5929 yards, and then in 1926 the partnership of Simpson and Fowler oversaw the redevelopment of the course, although many of Tom Morris’s original greens and basic routing are still in evidence. In more recent times small alterations have been made to the course, such as the addition of new tees and bunkers, and the length now stands at 6263 yards.